Groupe Renault is announcing the launch of its “Advanced Battery Storage” program, which aims to build the biggest energy stationary storage system using EV batteries ever designed in Europe by 2020 (power: 70 MW / energy: 60MWh). This system, installed on several sites in France and Germany, will facilitate the integration of renewable energies into electric grids. “Advanced Battery Storage” is part of Groupe Renault’s strategy to develop a smart electric ecosystem in favor of the energy transition. Groupe Renault, the European leader in electric mobility, announced today the launch of Advanced Battery Storage, a stationary storage system for energy developed exclusively from EV batteries. It will have a storage capacity of at least 60 MWh, making it the biggest system of its kind ever built in Europe. The first facilities will be developed in early 2019 on three sites in France and Germany: at the Renault plants in Douai and Cléon and at a former coal-fired plant in North Rhine-Westphalia. The storage capacity will then be gradually expanded over time to contain the energy of 2,000 EV batteries. At this phase, the system will have reached – or more likely, exceed – the 60 MWh, equivalent to the daily consumption of a city of 5,000 households. The purpose of this system is to manage the difference between electricity consumption and production at a given time, in order to increase the proportion of renewable sources in the energy mix. This means maintaining the balance between offer and demand on the electricity grid by integrating different energy sources with fluctuating production capacities. The slightest gap between consumption and production sets off disturbances that can compromise the stability of the local frequency (50 Hz). 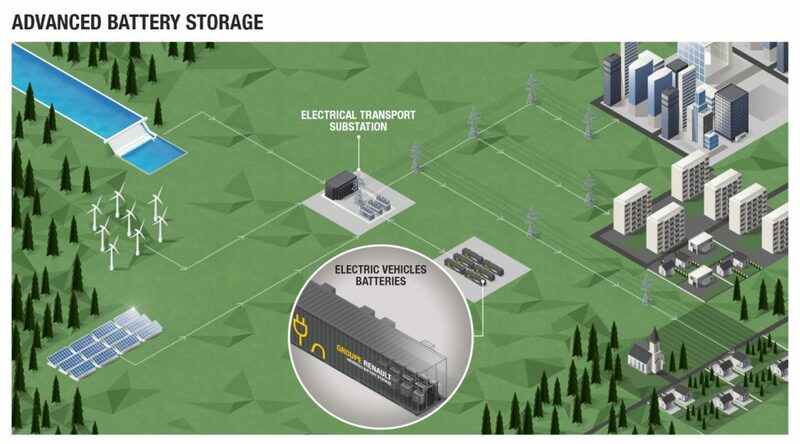 “Our stationary storage solution aims to offset these differences: it delivers its reserves to a point of imbalance in the grid at a given time to reduce the effects,” said Nicolas Schottey, Director of the Groupe Renault New Business Energy program. By helping to maintain the balance of the grid, the stationary storage system will boost the economic attractiveness of low-carbon energies. “This unique assembly will give Advanced Battery Storage the capacity to generate or absorb, instantaneously the 70MW power. This high power combined with high capacity of our solution will allow to react efficiently to all major grid solicitations”, explains Nicolas Schottey.